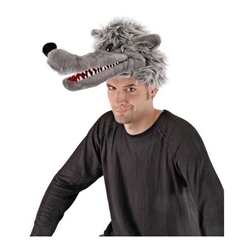 Big Bad Wolf headpiece features a gray faux fur wolf hat with oversized teeth and large eyes. It can even be a puppet. If there are any pigs around when you don this hat, they will be running for straw, sticks and bricks. Headpiece includes puppet hat, fabric lining, secret pocket with fortune and velcro size adjuster. Fits adults and kids with head dimensions of 56-59 cm (22.5 inches).